Ok, I'll start taking pictures of new colour combinations and post them on Instagram. We'll have the gallery up on our website too. We also eventually want to have a Grinder Builder App on our website that visualizes the different colour combinations. That would be pretty cool. Were there any specific colour combinations you wanted to see? I ordered Sapphire top/bottom, emerald/gold/hematite plates, so if you have Sapphire main with various middle colors that would be cool. You're totally right, a builder with real photos would be perrrrrrrrrrrfect. Also, aughh! 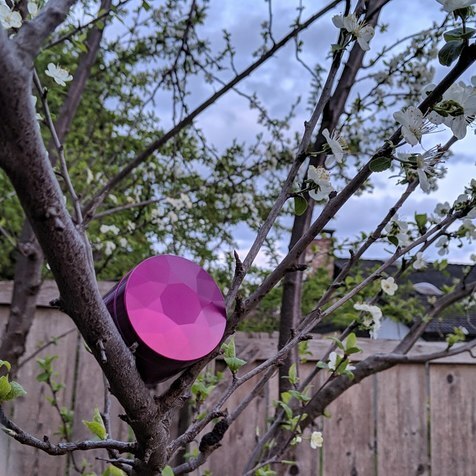 I started searching and am seeing some crazy dark pink / purpley one! Do you have more colors than I knew about? Is it too late to maybe change to new colors? 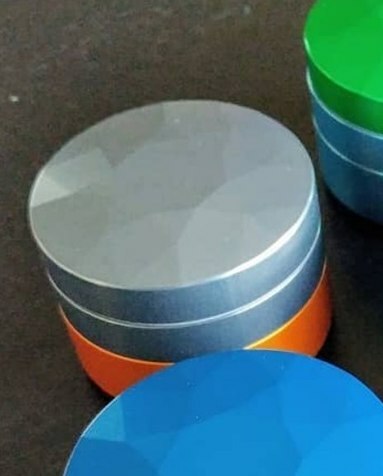 I'm having grinder color related anxiety! Cool shot! Cool log and growth too! My Onyx is on its way, maybe end of the week it will delivered. Thanks! I think it is beautiful. IMO, the colors are a major draw. Must be a nightmare logistically, but as a consumer being able to mix and match multiple colors is just cool. I ordered the purple coarse plate, so I definitely approve :grin: . All purple looks fantastic as well, easily in my top 4 for a single colour along with sapphire, emerald, and sky blue. I like a good pop of colour for one and the way those colours reflect the light in the pattern of the grinder is jaw dropping. I'm sure in person every option is amazing but from the pictures I've seen those are my favourites so far. and a bright yellow if it can be made to look a lot different then gold. I've gone on and on about colour but a nice white, something with depth, would satisfy a few people too I bet. Wow that orange looks great! Wonderful pictures....I am enjoying my BCG very much and am completely happy and satisfied with this product. are yall doing a purple color ??? Scroll through this thread, FC's thread & GFL's instagram profile page. Yep, but as a consumer this is a pretty big pain, hence my suggestion for the consolidated location. It's not super helpful trying to do side-by sides if you've gotta open up a new tab for every image you find. Regardless, it sounds like they're working on this already, so woo hoo! @MothChewMoth, a while ago I made the suggestion that they put a color configurator on the website, but they've been swamped. yep yep haha there are just so many combinations! I am ready to pull the trigger on a pink BCG (my wife loves this color)... Any suggestions whether to go with Fine, Medium or Coarse plate for grinding herb for use on a vapcap? I have the Fine and Medium plates and they are definitely on the finer side. I like the Medium for use in my "M" but will be looking into getting the Coarse plate also. me too Baron. I just find fine ground to work better for me with all vapes. Essentially it just makes it easier to get a better and faster extraction with less work, thought and maintenance involved once loaded. And even with this grind and a fully loaded vapcap chamber I'm not really struggling for airflow although Bud's pick tool does coming very handy here just to poke in there and make sure the air can get through. I do want one of those Big Friendly Giants though...wait, no, that's the BFG by Roald Dahl! I keep getting them mixed up haha. :lol: That was a great story when I was a kid, good cartoon movie as well. Maybe one day I will own a BCG. I used my NVFG yesterday to make a killer batch of edibles from 12 grams of flower. The NVFG is certainly very handy for this application because you can fit a fair amount in there each time and it got it really fine, but not completely pulverized and still not as fine as the Gr8tr. Dont need/want it too fine for coconut oil extraction, but I can't help but think that the finer the grind the quicker and more complete the extraction should be at a lower temperature. The real bonus however was the miniature bundle of herb in muslin at the end those 12 grams of flower compressed into about 1.5 square inches which makes it so much easier to squeeze most of the oil out of the herb and lecithin into the jar. The muslin bundle sits in the fridge now to strain with boiled water into super tasty, super potent cups of herb tea. Except you never know what dose you are taking this way. You could effectively be taking 10 to 15 grams of coconut oil depending on the volume and initial squeezing. As a measure, 2-4 grams of oil, straight from spoon or mixed with lecithin, nut butter, salt and pepper as a sort of delicious (to me anyway) canape, would be a typical dose. Black pepper is for better cannabinoid utilisation. I use the medium the most. The Fine plate turns my material to dust lol. oh yes, I didn't think to say, but using this mega fine grind in my Omnivap- I rarely ever get a full 3 hit extraction from the load these days. I get 3 very good, milked out hits. Pretty equal, varies which one is biggest (due to my torching skills I expect). But then always a good 4th hit too, and if I can be bothered, a decent 5th. By that stage I prefer to reload but when I tip my ABV out there is still some lighter tan left to it. Not like the almost charcoal brown as standard, after 3 hits, which I grew accustomed to in my vapcap youth. Pros and cons to more hits per load though I know you can appreciate. One- I underestimate how much herb I am going through and I do not accurately appraise my level of medication which can result in me getting considerably more wasted vs using a coarser grind. 3 loads can probably equal a half gram almost, big difference. 2 full Ti tips of fine ground is a fair bit of herb. Plus it's nice to have a fresh load every 3 hits. Still, I wont go back to coarser. I dont need to heat so harshly to get identical and sufficient performance every time with the fine grind. It's much more forgiving of my torching skills and I haven't come close to combusting in my vapcap for a very long time now that I think of it. This did happen too frequently with the coarse grind where performance and vapor production was less consistent and more dependent on torching technique. Funny how we are all different sometimes. I just posted this in another forum. I’ll have to try hydrating my fine leftovers, lol as I only hydrate my unground flower and have been grinding about an eight at a time. Because I have so many strains(cutting back significantly on strain variety as I mature with MJ use) by the time it gets to the end and all that’s left is fine(probably a big difference between fine leftovers from med/coarse grind and a true fresh fine grind from a fine plate grinder) it’s pretty dry, like maybe 20% here in Colorado. If I use a fine grind in a Dynavap I try to put a few tiny tiny buds or coarser grind on the screen first, then fill it to the max very loose and works great, not what prefer but when you get to the bottom of that’s all that’s left of a medium or even coarse grind, whats left is usually pretty fine and potent!. Medium grind I fill to the top and ever so lightly tamp to leave a little gap. A fresh fluffy grind from my slx(grind right side up as slow as possible to get the coarsest grind you can get out of it) I pack kinda tight with no air gap and for me, that’s how I like it best. 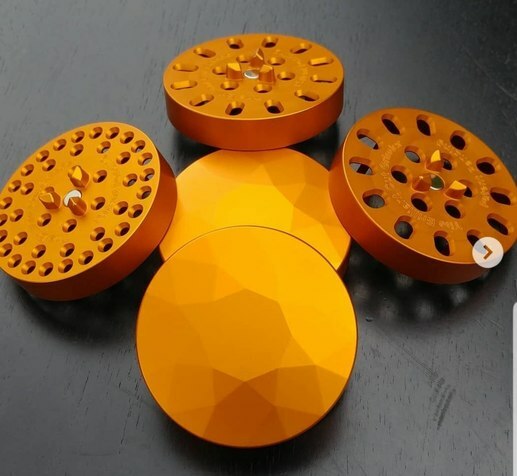 I have no idea how this compares to the BCG but looking forward to finding out, mine should be here any day(7 weeks before it shipped a week ago because of my color choice I guess) probably getting close to the same weight per cap regardless of grind but I have never measured. Thanks for the replies! I decided to get both the fine and medium grinders with my order... Can't wait to try it out. I am hoping my choice of color (all pink for the medium plate plus a fine silver plate) means quick shipping of the order.